A 40 year old woman underwent a hysterectomy and bilateral salpingo-oophorectomy for a pelvic mass. The resection demonstrated a markedly distorted uterus with a 15.7 cm subserosal leiomyoma. One of the ovaries was enlarged, up to 8.7 cm and had a pink-tan, edematous appearance. On cut sections, the ovary appeared to contain multiple cysts filled with clear, serous fluid, ranging from 0.3 to 1.0 cm. There were no other significant gross abnormalities. 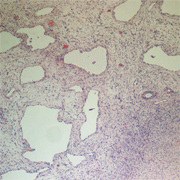 Histologically, the leiomyoma demonstrated no atypical features. The ovary showed edema and numerous thin walled spaces of varying sizes. No cytologic atypia was identified within the spaces which contained light pink material. 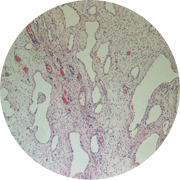 Focal lymphocytic inflammation was present within the ovary. 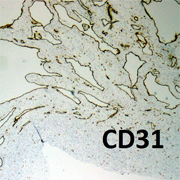 Immunoperoxidase stains were performed and showed the lining of the spaces to be positive for both D2-40 and CD31. These findings supported these spaces to represent benign lymphatic vessels and a diagnosis of benign lymphangioma of the ovary was rendered. Lymphangioma of the ovary is rare and can be distinquished from hemangioma by immunoperoxidase staining for D2-40. 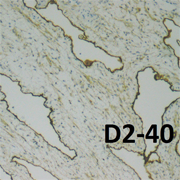 D2-40 stains lymphatic spaces but not the vascular spaces of lesions such as hemangioma. CD31 should be positive in both lymphangioma and hemangioma.